Just How Many Concurrent Projects Can You Have...? So I'm back "on the wagon", so to speak, and moving again after my short-lived drop in motivation. I've got the Christmas quilt in "hand quilting" stage, the William-Morris print quilt in "finishing the sandwich" stage (I have to put more safety pins in, as the adhesive spray experiment was a total failure), and now Katherine's quilt in the cut-and-piece stage. I've also got a couple of other projects that are moving up the queue - a table runner which I haven't told you about (or have I?) and a couple of smallish log cabin throws. That's how I like it: overlapping projects. I'm remembering that dark day back in 2010 when I'd finished my first quilt (HOORAY!) only to find that this happened on the day before Good Friday - and my favorite fabric shops were closed for the entire Easter weekend (including Easter Monday). EEK! I suffered from quilt withdrawal and vowed then never EVER to be without a project at the ready. Well, folks, I sure made good on that vow. If you've been following this blog for long, you know I've got an enormous UFO stash. Well, it makes me happy - keeps me off the streets. Quilt 16: Center Blocks are DONE! 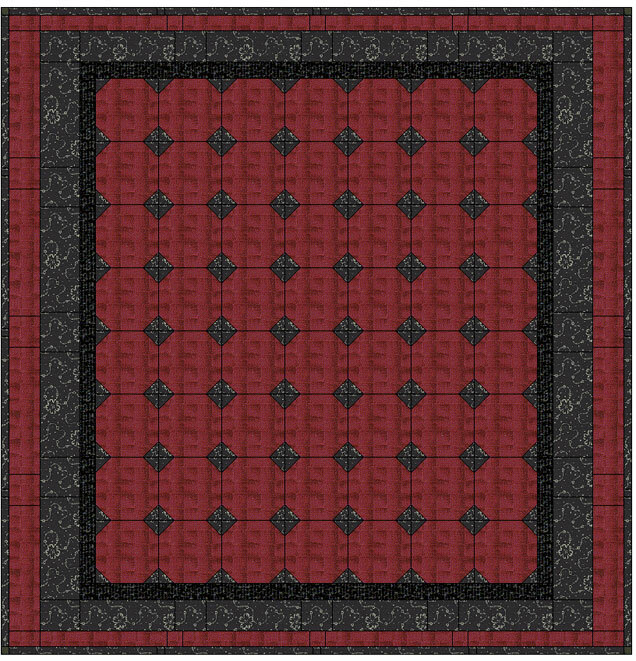 As you can see from the design (below), I decided to make the grey corners larger. 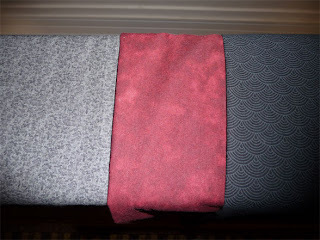 The reason I did that is that the maroon fabric was going to overpower the tiny grey print. Now that I can see the finished center, I'm very glad I made that adjustment. 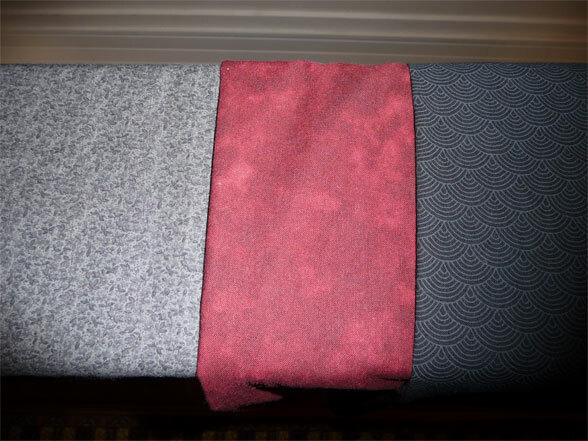 After that, successive rows of the maroon and grey - the same fabrics used in the snowball blocks. That part should go fairly quickly! And now to share the lesson I learned with this one: If I had it to do over, I'd have put a lattice around the snowball blocks. As it sits now, it actually looks more like grey diamonds as a design. An inch-wide lattice would have interrupted the connections between the blocks and given more definition. It took a while to get it all done, and I found that I can work straight for about two hours, but then I need a rest (if only just to get up and walk around a little). This quilt is a pretty simple one and it's coming along quickly! I'm a very fortunate woman - we have a spare bedroom here which I've set up as my office and work room. It's right next to the laundry room - where I keep my ironing board up and ready 24/7. Yes, I live a life of luxury. 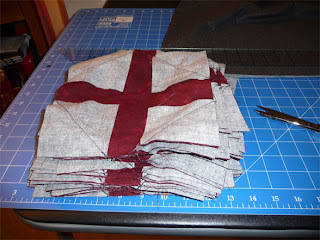 On the "down" side - I've been doing my cutting downstairs - on the dining room table. This affords a certain amount of enforced exercise - which is OK, I guess, but it's inefficient. As I'm cutting out quilt pieces I find myself running up and down the stairs - and it's annoying to have to shift my gear at dinner time. And, well, it also means I'm spreading my creative "mess" all over the house. 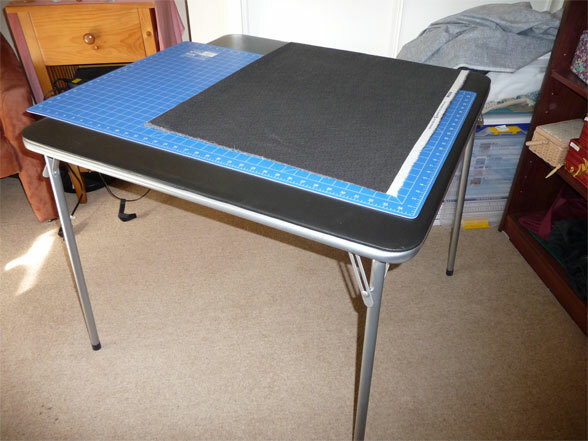 So I decided to get a card table that I can store in the laundry room - where it's at the ready, but out of sight, and when I'm in "cutting mode" have it in my office here right next to the desk where I put my sewing machine. I'm thinking this is going to cut my cut-and-piece time down by at least a third, as I can just leave it all up as I'm working. 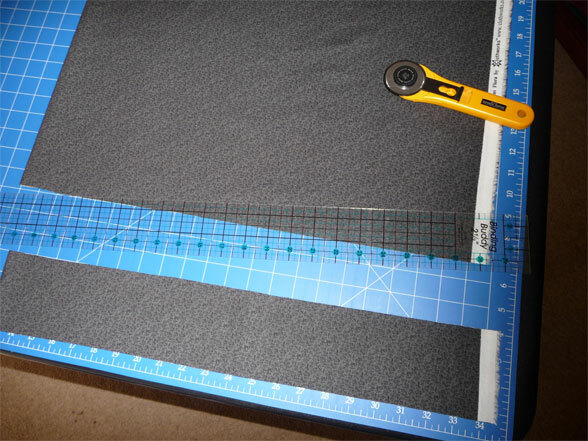 As you can see in the photo above, my cutting mat hangs over the edge a little, but that's OK. I've never had anything that was that wide - the grey fabric you see in the photo is half-folded 45" calico - and that's how I cut my pieces out. Not that great, really. 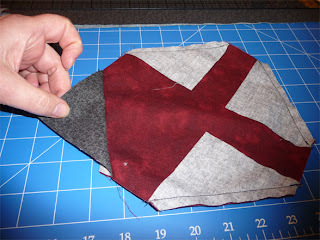 I've cut the first strip for Katherine's quilt - and found that although I was able to do it, the table has a bit of "give" to it when you press down. That makes accurate cutting a little more difficult, as the fabric wants to slip a little. I was able to cut accurately, but had to go a lot slower than I'm used to moving. I've just changed the blade in my rotary cutter, so I don't have to press hard - so this still may work out - or I may have to look at getting a better table (I do have other uses for the card table, so it was something I wanted to get anyway). Nothing gets the blood flowing like a new project. Why bother finishing what you've already started when the siren call of "new" is heard? 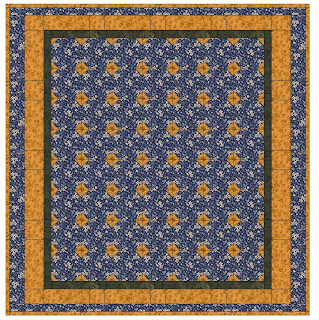 A very dear friend in Colorado (Katherine) asked me if I might be willing to do a quilt for her and her partner Kathy - and of course I answered with an enthusiastic "YES!" (these days I'm on the lookout for victims). She wants to have the quilt machine-quilted, which I don't do at this stage, and found a shop that will do that for her. 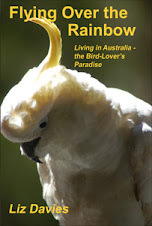 So I'm going to make the top here in Australia and she'll have it finished there. 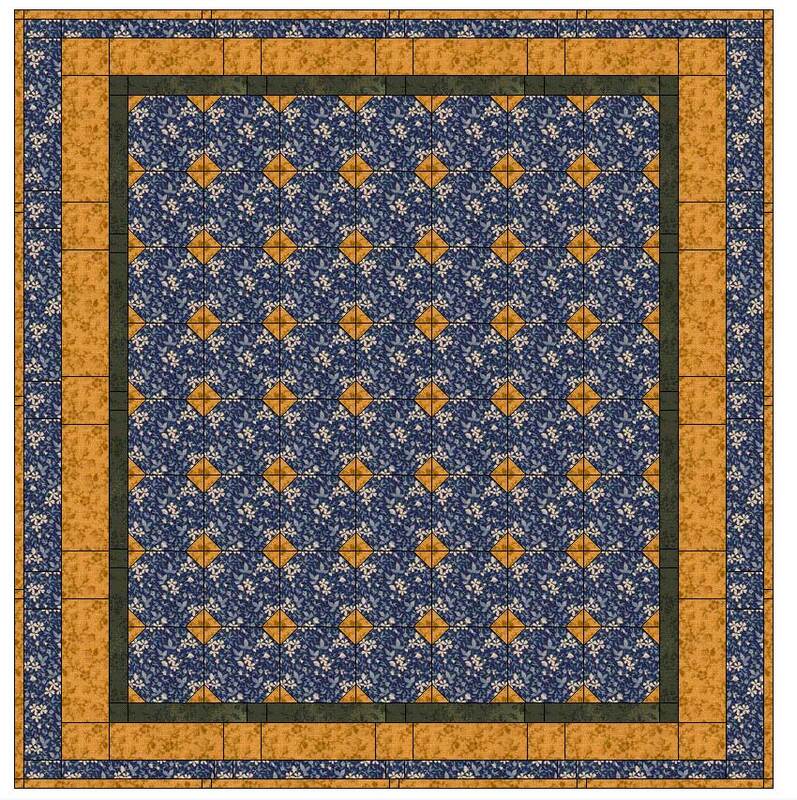 As I'm planning to visit them later this year, we agreed that they'd buy the fabric there and ship it to me - then I'll make the top before I head to the states. The top center is made of "snowball blocks" using a blue print in the center with tan corners. Katherine wanted a splash of grey, so we inserted a grey frame around it, with the tan and then blue borders to finish it off. 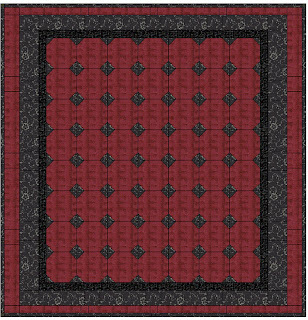 I sent the reworked image off to Katherine and she confirmed it's what they're wanting -she said she's thinking of it as a "winter quilt". There are 56 "snowball blocks" (which means 56 red squares with 224 grey corners) - and then, of course, the borders. 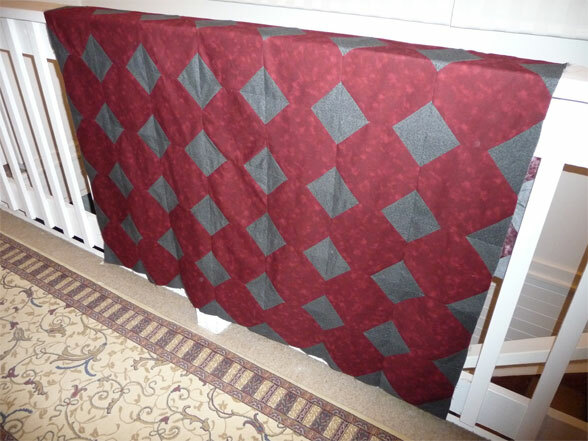 My very first quilt - back in 2010 - was red/white/black with snowball blocks. Have I come full circle now?